Symthic Forum was shut down on January 11th, 2019. You're viewing an archive of this page from 2019-01-09 at 03:48. Thank you all for your support! Please get in touch via the Curse help desk if you need any support using this archive. Simple and straight, the actual weapons name and a side picture of it. The theoretical* amount of bullets the weapon capable to fire in a minute. The actual speed of the bullets. note: Battlefield physics are implying velocity loss, range only limited by max range (1.5). The maximum distance you can shoot, after that barrier the bullet simply disappears. note: Except sniper rifles, all bullets can fly 1.5 seconds, so the distance is calculated by 1.5sec * bullet velocity. The percentage amount of suppression that one single bullet makes. 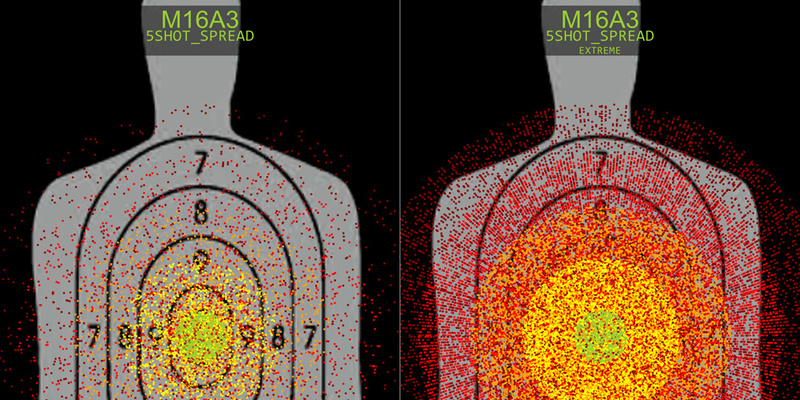 A graphical representation of the bullets damage over range. The vertical axis is the damage in points, while the horizontal axis is distance in meter. The numbers on the lines are the breaking points. On the sample image, the damage is flat at the maximum 25 until 8 meters, then a linear dropping off until 50 meters where it reach its minimum value 18.4. Over 50 meters, the damage is flat minimum (18.4) until the maximum distance (975m). Top value: Reload time if you contain at least one bullet in the chamber. Middle value: Reload time if you shot all of the bullets. Bottom value: Reload threshold, which means if you started the reloading sequence, you are unable to change weapons until the threshold time ended. note: The different reload times come from the pulling mechanism. If you still contain a bullet in the chamber and the bolt is pulled up, the soldier only have to change the magazine. If you shot all the bullets, the soldier has to pull the bolt at the end of the reload. The maximum amount of bullets you can contain. On most weapons it is the one magazine + one additional bullet in the chamber. The type of ammunition the weapon is using. If you select an attachment in the "Select attachment:" tab, you can check what kind of multiplier it gives for the weapon. note: These are all multipliers, and if you selected one attachment, the system automatically calculates the results. (So you see the multiplied data in the chart). If you click this button, you'll be redirected to the weapon comparison page, and the "Select Weapon 1" will be the one you've clicked on. PLots are graphical representation of a weapons firing characteristics (spray). These characteristics are defined by the weapons recoil, spread and rate of fire. These basic plots are very usable for comparing weapons, because of that you can find them at the bottom of the weapon comparison page. Understanding the plost are easy, basicly the program simulates a given number of 5 round bursts (2000 in this case) shot into the same spot, without correcting any recoil (not moving the mouse). For better visibility it colors the different bullets of the burst. The first is green, and it fades into red witch is the 5th. In the end, you'll get a spray pattern where you can see the approximate landing of the bullets. The more dense areas are the most important, but you can see the worst case scenarios, when the bullets are landed very far. (That is the time when every random value got the worst case). Most of the time they are specific, bigger, contain more data and more detailed. Plot making tutorial at 4.1. You can type any text here, but if used correctly it helps to identify the plot. The adjustments added in the program, mostly used for reproducing attachment multipliers. 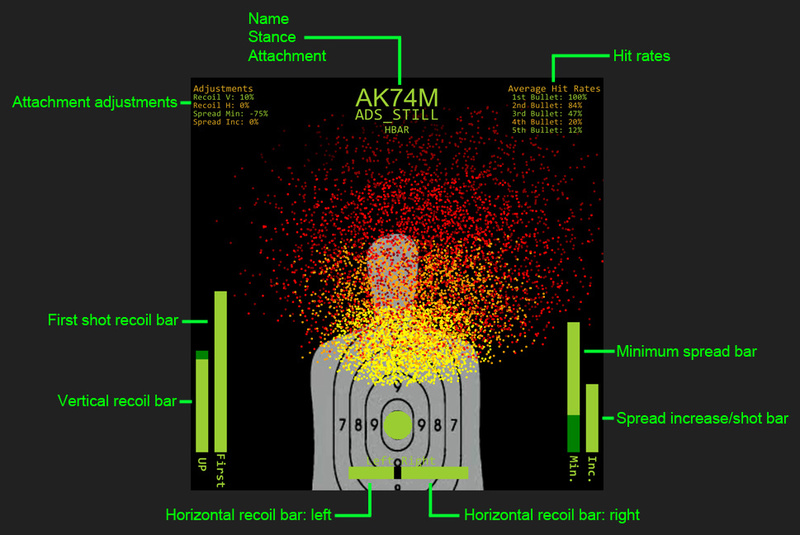 note: AK74M actually has +7% vertical recoil from HBAR, not +10% as on the picture. A graphical representation of the actual first shot recoil. A graphical representation of the vertical (up) recoil. The brighter part of the bar is the default value, while the darker one is the one affected by the Attachment adjustments (2.2.2). 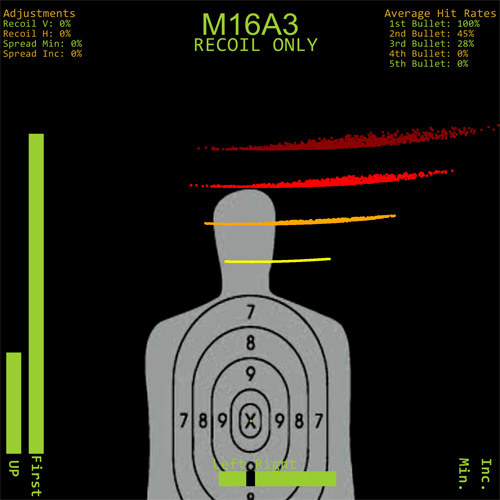 A graphical representation of the left/right horizontal recoil. note: If foregrip would be used, there would be a shorter darker bar which would show the decreased side recoil value. A graphical representation of the spread increase amount. A graphical representation of the minimum spread. It shows the calculated chances of hitting the shown target. note: Sadly body and headshot are not marked separately. In battlefield 3 a weapons firing characteristics are defined by values. You can find these values at the weapon charts, and a tutorial for them at 1.1. Vertical recoil defines how much the barrel moves up after every single shot. The value is in degrees, and this is a fixed value (except FSR). The two horizontal recoil is a bit different, since these are the limits of a random value. In this case it is between -0.1 and +0.3. These values are degrees too. Recoil decrease means how much recoil is decreased per seconds, but it is only apparent when you are not firing. So this value determines how fast the barrel will go back to the initial position after shooting. note: The stated recoil decrease mechanism could be not completely right. The actual mechanism is under investigation. 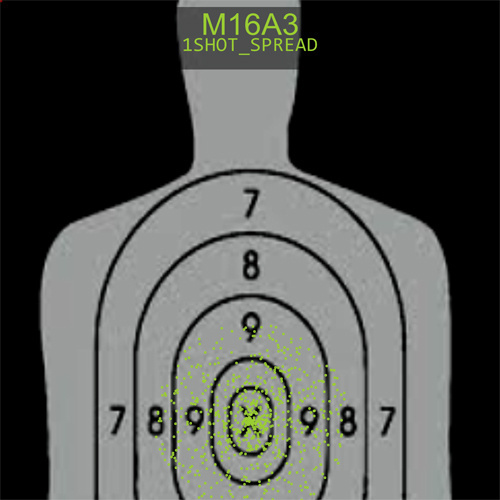 Spread like recoil is defining the weapons spray pattern and accuracy, but this is not as visible as recoil ingame. But on the plots with a lot of brusts simulated, it has a very defined looks. In short, it means how inaccurate the weapon is. The amount of spread is defined by 2 important, and one side value. The first and most important is the minimum spread. Basicly all white numbers are minimum spread for the same weapon, but in different states. The Aim Down Sight column means when you are using a scope or iron sight. The Hipfire column is when you are NOT using scope or iron sight. Stationary and moving is obvious. These are the Minimum spread values, witch is a bit confusing because Minimum is actually the starting spread. It defines the size of a circle around the aimed target (where the barrel is pointing). The bullet will be in a random place in that circle. The other important value is the Spread increase. It is very simple, it defines how much that circle is bigger in every shot. The left plot is a simple plot with 5 round burst simulated 2000 times. While the right is an extreme 20000 one, where you can clearly see the banding at the edge of the circles. The third value (Spread decrease/second) is not connected as close to the accuracy of the weapon as the other too, but still very important. It defines how fast you can reach the minimum spread after shooting/moving/jumping...etc. Since my english is not native, I gladly take any grammar corrections. Also if you have any note, or see a mistake, please correct me. note: Also, I'll write a plotic tutorial tomorrow, if anyone have a suggestion about what else i should make, please share it! On "Minimum actually the starting spread." should be "Minimum is actually the starting spread." That part is located right above the Spread charts/topic where you go into talking about Spread. Just a small grammatical change Good job! On "Minimum actually the starting spread." should be "Minimum is actually the starting spread." That part is located right above the Spread charts/topic where you go into talking about Spread. Just a small grammatical change :) Good job! Any idea what kind of update would be fine here? I thought about plotic, but since very few people are using it, I doubt it would be really useful. A thing of beauty this thread.